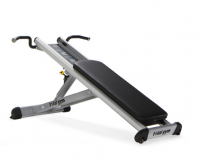 Total Gym is the world’s leading privately-held manufacturer of functional and bodyweight training equipment. Founded in 1974, the San Diego-based company’s Total Gym products are used in 14,000 physical therapy clinics, athletic training facilities, hospitals, universities, professional sports teams and health clubs, inspiring over 24 million workouts per year worldwide. Remote control handles allow touch-control level adjustments while exercising. Adjustable glideboard promotes optimal spinal alignment and training variations. Automatic rail locks allow for explosive plyometric jumping. Multiple center-pulley attachment points double arm-cable load and increase lower extremity ROM. LAT bars promote line-of-pull specificity for arm-cable exercises. Includes workout DVD and exercise wall chart. More than 200 exercises and variations from resistance training to Pilates. Total Gym GTS is the award-winning equipment anchor for GRAVITY, the time-efficient, personal training, group fitness and Pilates program that is generating excitement and variety in commercial facilities around the world. Total Gym Sport is the latest addition to the Total Gym bodyweight trainer product line designed for small footprint commercial facilities, studios and in-home training. Designed for those who need or simply want the best, PowerTower allows the user to adjust the resistance level during an exercise in progress with a simple press of a button. The GTS Classic—winner of three 2004 health club industry innovation awards—provides for a full-body, intense workout in 30-minutes without the use of any additional accessories. The Total Gym Leg Trainer engages all the muscles of the leg simultaneously for an efficient and effective lower body workout.